Spice up any Florida vacation with an exciting 2.5-hour dance cruise on Tampa Bay. Beginning in St. Petersburg, relax, enjoy the beautiful scenery and listen to live music on board the elegant 'StarLite Sapphire' yacht. Choose from the open-air observation deck or select the climate-controlled dining cabin inside. Either way, the view is incredible and the party is just getting started. 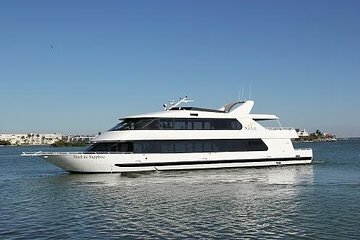 Disfrute de un crucero relajado a la hora de comer a lo largo de la Bahía de Tampa y las hermosas aguas interiores de San Petersburgo. El StarLite Sapphire es un moderno yate comedor de 113 pies (34 metros) con una zona de asientos interior y plataformas de observación al aire libre. El comedor interior ofrece muchos asientos cómodos con grandes ventanales para ver los sitios, mientras que la cubierta exterior proporciona aire fresco y una vista abierta del paisaje. El zafiro puede acomodar hasta 150 pasajeros. Escuche música en vivo, tome una copa en el bar a bordo y baile toda la tarde. Para el almuerzo opcional, hay seis platos principales para elegir: marisco (selección del chef), cosecha vegetariana, cordon bleu de pollo, carne de borgoña, criolla de camarón o una ensalada césar de pollo. Todos los almuerzos se sirven con ensalada y pan. Las bebidas no están incluidas. Superb cruise. Easy to locate, very organised. Beautiful boat, good food and singer was also very good. Had a fabulous view of the bay and all the lovely houses, saw dolphins, was all over too quickly, could have stayed out there all day. Probably my fault for not reading properly but ordered starters not realising they weren't included in the price we had paid so had a larger bill than we expected, when we thought it would just be drinks. This was a great easy Sunday afternoon. The lunch meal was great, we enjoyed the food and and the service was excellent. Jay did a great job. Was very good!!! And everybody was nice, I like the food, the food service and the captain was so gentleman, the music too, in other words I enjoyed and my family's also, thank you so much for everything, and I would like to go again, maybe later. Byeeee. Very nice! Food was excellent - entertainment was great - staff was very nice. Only complaint was that we were told all food was included (including appetizer) by your staff at the ticket booth, and it was not. Excellent trip, food and entertainment. A good time was had by all of us. Thank you for having the band wish my sister a Happy Birthday. She was thrilled.